If you have offered to give a baby shower and the Mom-to-be wants an elephant baby shower, I can help you with some planning of the event. Picking out the invitations is one of the first steps to take when planning a baby shower whether it has an elephant them or not. It can set the tone and color scheme of the party. You can go to any shop that carries shower invitations and get the same old boring ones that everyone else gets or you can order a uniquely different elephant baby shower invitations from a place like Zazzle. Here are just a few of the many elephant shower invitations available. Many of them have matching stamps and thank you cards. An advantage to ordering your invitations from a place like Zazzle is that you can type in the information for the shower and they are printed up for you. That means less time spent with not having to write out the information on each individual card. Be sure to order the invitations in plenty of time to send them out to your guests. If you are having out of town guests, your invitations should be sent out at least a month before the planned shower. To find out more about Baby Shower Invitations Etiquette you can read my blog post. 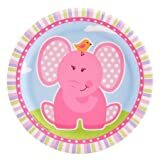 You will need to get some party supplies for the shower and you are in luck because Amazon does have elephant baby shower supplies. There are elephant plates with coordinating napkins, cups, and plastic tableware. There are even centerpieces that are a dialper cake with the elephant theme. I have featured a few for you below. There are two types of elephants in the world today. The Asian elephant is the smaller of the two species. It is known for it's large body and small ears. Only male Asian elephants grow tusks. The African elephant has very large ears and both genders grow tusks. Elephants have been loved by people the world over. We love to see them at the circus and zoo. They have also been loved by famous people too. Some believe an elephant with his trunk up is a symbol of good luck which would indicate that an elephant with its trunk down would be bad luck. However, I saw a reference that said that an elephant with its trunk up "stores" the good luck while the trunk down "dispenses" good luck. I mentioned above that you could take the list of fictional elephants and create a game with it. You can have the guests name fictional elephants. Another idea is to print the names in one column and the explanation of who they are on the other side (mixed up of course). Your guests will need to match the explanation with the name. Another fun game is the bottle drinking game. Take bottles (that can be given to the new Mommy later) and fill them with a couple ounces of water. Have your guests race to drink the water from the bottle. Hint: It takes longer than you would think so more than 2 ounces in the bottle will be too long for most people. This game can also be used as a tie breaker. Have family members lend you some baby pictures of themselves. Display on a wall with numbers next to them. Have your guests write down who they think each baby is. Putting one or two non-family members adds to the fun. Let me know if this helped you get started on your elephant baby shower plans. Yes it is right that we must give a hint of the theme to be organized in the shower program. The theme must reflect the shower program so it will be easy to have a good and enjoyable party. This elephant theme is very nice and adorable too. Diaper cakes, invitations are add a lot to the party. Very cute ideas. 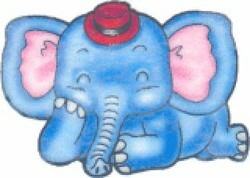 You've left out one of my favorite elephants, though: Horton. He's very loveable!